You’ve been to the zoo, right? Maybe you’ve seen a chimp sit on his haunches while looking far away with one eye and then the other. He jumps to his feet, and one arm starts whirling like a pitcher’s. He has something in his hand. Yuck! He threw his own … oh, never mind.. Researchers at the Yerkes National Primate Research Center of Emory University see a lot of this behavior. They know that “aimed throwing” is rare in any species except chimps and humans. Intrigued by why that might be, William Hopkins of the Center noticed that, as a “go-away!” gesture, it’s particularly effective. And if throwing excrement is primate communication, he wondered, was it once a precursor to human speech? Hopkins tracked throwing behavior in a group of chimps and found that some had really good aim. MRI images of their brains showed that the areas corresponding to the speech area in human brains had more white matter than average. White cells hold the connectors linking brain areas. The abundance of white matter suggested to Hopkins that the speech centers of these chimps were unusually well-connected to the rest of their brains. 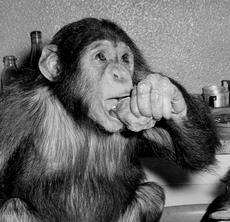 As it turned out, those chimps were excellent communicators. They were also sophisticated socially, and particularly good on problem-solving tests. Hopkins says it’s possible that aimed throwing developed as an aid in hunting and defense, and that chimps who threw well may have had a survival advantage that got bred into their children and their children’s children. Millions of years later, here we humans are—smart, talking—and some of us throwing terrifically—but not always well enough to stop the best batters.